Fuel the most important muscle in your body – your brain. Whether you’re an international level or just a weekend warrior, focus is key to your success and the combination of EPA and DHA in Activeman® Focus has been proven to enhance brain functioning. What’s more, the omega fatty acids in Activeman® Focus can also reduce your risk of heart disease, diabetes, and cancer, while also improving joint functioning. They also have muscle-building and fat-loss benefits for athletes. So, why wouldn’t you use it? 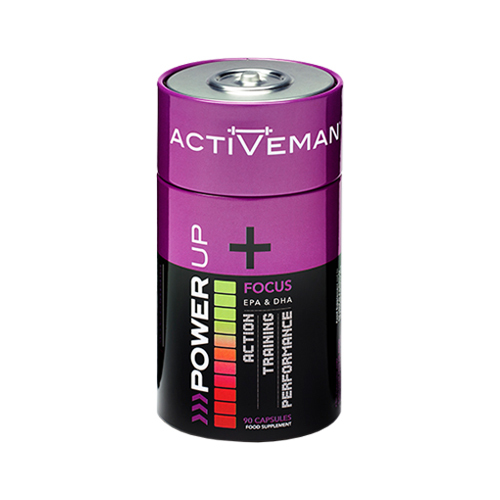 Activeman® Focus is a premium quality source of EPA and DHA that are derived from fish, flaxseed and sunflower oils. Every capsule gives you a 1,000mg dose of omega 3, 6 and 9 to support your diet with healthy fats that can be hard to get through food alone. The combination of these fatty acids is proven to enhance proper brain function and improve concentration – an essential aspect of athletic performance. Whatever your sport, the mental side can be just as important as the physical. That’s where Activeman® Focus makes a difference. What’s more, omega 3, 6 and 9 can also enhance the efficiency of the cells in your muscles, meaning they could improve endurance while also helping with fat loss and muscle building. That’s why supplements like Activeman® Focus are becoming more and more popular with athletes. The other health benefits of these fatty acids are hard to ignore, such as their potential to improve your cardiovascular health, reduce the risk of cancer and maintain a healthy immune system, while also being good for your skin, hair and nails. Activeman was developed alongside three-time Olympic gold-medallist, James Cracknell. IS FOCUS RIGHT FOR YOU? If you’re looking to improve your mental game, which is especially important in longer endurance events, then the answer is yes. Whether you’re at the front or back of the pack, you can performance better by improving your concentration. As you’ve read above, our omega 3, 6, 9 capsules can enhance the function of the brain, as well as the heart. So, Activeman® Focus is an essential supplement for just about every sportsman. LOOKING FOR OTHER PERFORMANCE PRODUCTS? You’ll find a wide range of options from Bio-Synergy, including Activeman® Oatein, Energy Charge, Thermolean and Free Motion, as well as the Body Perfect range. We’ve sourced the finest quality nutrients from the UK to achieve a premium quality content that is hard to match. Activeman® Focus is made from premium-grade fish, flaxseed and sunflower oils. Take three capsules a day before meals with a glass of water. "Bio-Synergy ActiVeman Focus scored 9.7 in our review which makes it one of the top products available in the Nutrition category. In order to reach the overall score we use a combination of expert product reviews, customer feedback and a range of other criteria, including brand reputation and 3rd party review scores. As a guide, a score above 8.1 would be considered good for products in the Nutrition sector. TradeReviewer.co.uk"